Isaac after his CT scan. I’ve heard this verse 1000 times. I even remember when my mom taught a Sunday school lesson about this when I was in high school. She gave everyone in the class a mustard seed, and I remember how tiny that it was. This verse is one that we say and hear often, but do we truly, honestly believe it? Last week, my husband and I were told that our 3 month old had craniosynostosis (where gaps in his skull were fusing together too soon), and that it would require surgery, followed by wearing a helmet. The doctor scheduled a CT scan just to be sure, but we went ahead and scheduled the surgery because the doctor was confident that it was necessary. We immediately began calling and texting our family, friends, and our church family, letting them know the news. Many people had already been praying for Isaac, and these people and so many more promised to continue to pray for him. My husband and I began praying too. We began praying for his upcoming surgery, for the doctors and nurses that would be working with him, for his recovery process, etc. We just assumed surgery was a done deal. During my quiet time, as I prayed for Isaac, I felt the Lord was nudging me to pray for healing, to pray that when Isaac had his CT scan done, that it would show that the gap was open as it should be. 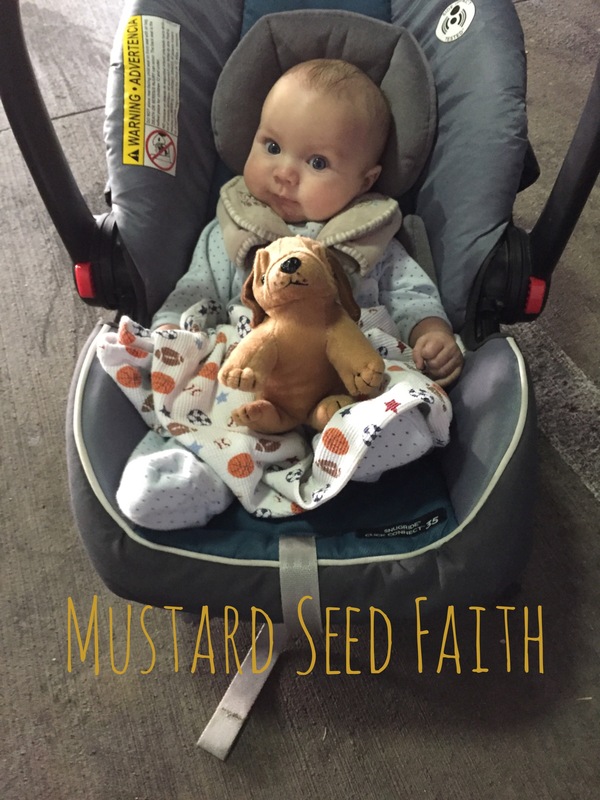 I quickly prayed, “Lord, if it’s your will let the CT scan show he doesn’t need surgery,” but I had mustard seed sized faith behind that prayer. I had already accepted that Isaac was going to have to have surgery, and forgot that if He chose, God had the power to heal Isaac. God is bigger than the problems with Isaac’s skull, and I had completely lost sight of that. We had Isaac’s CT scan done, and then we waited to see his neurosurgeon. His neurosurgeon came in all smiles. The gap in Isaac’s skull was open! My husband and I were in shock. The great news is honestly still sinking in. All of the glory belongs to Jesus for being so faithful. My faith was the size of a mustard seed- barely, but Jesus still used it. He used mustard seed sized faith and the prayers of so many wonderful people to change Isaac’s diagnosis. Friends, what is going on in your life? God is bigger than whatever you’re facing. Take your mustard seed sized faith to Him. Ask Him for more faith and to help you with your unbelief. Don’t be like me. Don’t be afraid to ask God for big things; He is, after all, the almighty, all powerful God. Get some godly people to petition the Lord in prayer on behalf of your situation. The Lord might not always choose to do exactly as we wish (I’ve been on that side as well), but whatever He chooses to do will be perfect. God is always good and always faithful. Watch Him use mustard seed sized faith and the prayers of His people to do immeasurably more (Ephesians 3:20), and when He does, glorify Him for the faithful, wonderful God that He is!